The Gerry Meehan Archives: "...Bring Back Meehan"? In an April 24 post titled "Maybe It's Time to Bring Gerry Meehan Back into the Fold," Moto reflects on his successful run as GM -- the team made the playoffs all seven years he was in charge -- and wonders if he'd consider a return. "Bringing in Meehan could certainly help this organization on a number of levels," he suggests. "First off, hiring Meehan would further enhance [owner Terry] Pegula's reputation for healing strained relations with former players. One only need look at Rene' Robert coming back into the fold, and the French Connection reunion at his first home game as owner, as a major step towards bringing all Sabres together....Pegula needs a trusted voice to be the face of his hockey operations. A voice they can connect with once again. It's not uncommon for an owner to go after a former player. The player, of course, knows the culture of the team and the area and also has a finger on the pulse of both the fans and media. "Meehan has had fairly recent success and his roots in Buffalo stretch all the way back to the Sabres formative years with Punch Imlach. It also encompasses the genesis of Pegula's love of hockey dating back to the 70's, initially with the Broad Street Bullies, then with the French Connection soon after. 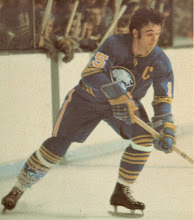 Those are the roots of Buffalo Sabres hockey. Meehan also has ties with and/or bridges three exciting times for the franchise, from the French Connection to the offensive juggernaut of Lafontaine and Mogilny to 'the hardest working team in hockey.' "
"Even if his career as a lawyer is still going strong, maybe there's a sense of unfinished business in hockey, and more specifically with the Sabres. And with Buffalo in need of a hockey guy, I don't think there's a Sabres fan anywhere who would dislike Meehan coming back into the fold and taking the reigns of the hockey department. Wonder if he's interested?"